This entire trip has taught me so many things that I don’t even know where to start. I am so glad my mind was open to many different things, and I learned an abundance of materials to utilize and take back home. The main thing I feel like this trip helped me develop is becoming more humble. It’s very hard in life not to have a moment to think about yourself, but when you only have a group of people to trust and look after, you began to become selfless. This experience taught me that it isn’t about me, it’s about the group. 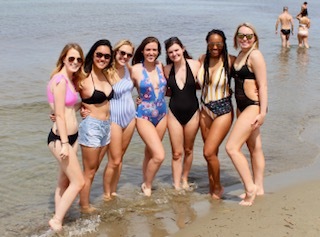 For example; though I may have been exhausted during some part of the trip, i needed to push through for my group or if someone needed something, I would give it without hesitation. This allowed me to learn how to truly put others first because we needed to take care of one another. 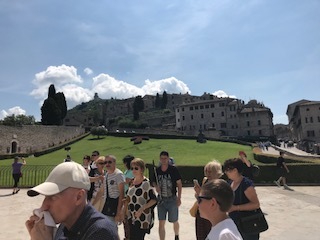 There were so many things that Italians do differently than Americans, such as walking everywhere or saving electricity so the lights aren’t used when we aren’t at home. I took a lot of these things for granted just because of me being close minded and privileged. 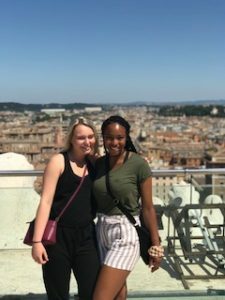 This trip made me humble myself and realize my privilege. I couldn’t just hop in a car and drive down the street to a grocery store, or I couldn’t leave my computer in my room to charge when I’m not there, and I realized that it’s okay. Cars affect the environment and so does the electricity and the economy, but I never realized that in American because I didn’t care to look at the overall picture. I saw so many people without homes, so much poverty, and it broke my heart. It really made me realize that even though I may not have much, there’s always someone who has it worst, so you give. I tried my best to give to those in need because I believe if you can do it, then do it. After many times I find myself being ungrateful, I have to remind myself of my privilege. Today was our last day in Rome, and it was a sad, but joyous day. It was so cool to reflex on this experience and see how close I got to people, without even thinking I would. Today was so fun because we got to see the Colosseum and the Forum. Walking around Rome one last time was bitter sweet because i honestly grew to really like Rome, despite its busy city and crowded area. 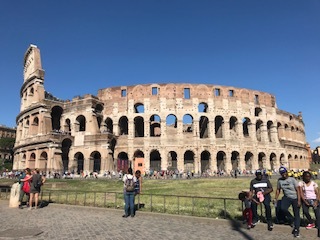 It was so interesting to learn about the Colosseum, and its rich history. Learning about the morbid things that happened in the Colosseum were fascinated, yet disturbing because it was insane how people could be treated that way just because they were different. There were dog fights, boxing matches, animals mauling humans, and more that went on in the Colosseum. They didn’t have the bottom of the arena cover up, so we were able to see where the animals and prisoners were kept underneath the Colosseum. 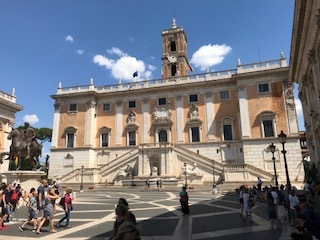 The seating arrangements were interesting, starting with the first level being the most important emperors and superior, next was the senate, the third level were for Roman citizens, the the fourth was for everyone else. The ones closest to the arena (the emperor) were the ones with the most power over what’s going on in the arena, or who called the shots. It wasn’t what I expected for some reason, and I think it was just because the bottom part was open and didn’t have sand covering it. We then went to go see the Forum, and that was pretty cool. Honestly, by this time, my feet were killing me so I was kind of checked out. For the most part, I was listening and I learned that the Forum is the center of Rome and that it also had buildings with different purposes, like a senate chamber, treasury, and more. To end the day, we had our farewell dinner, and it was so sad. I’m truly going to miss everyone. This was such an incredible experience, and I wouldn’t trade this for anything in the world. I almost teared up a little when everyone was giving their speeches. Lastly, It made me happy to see and hear people talk about their growth, and I can’t wait to see what PCS can bring back to Norman to make a change. Chao! Italy for life!!!!!!!!!!! Today was the day we’ve all been waiting for: miles of walking. I didn’t believe it would have been bad until I took the journey myself. I really do love to walk and run, but when there’s so many people and too much commotion going on around you, it gets very hot and overwhelming. 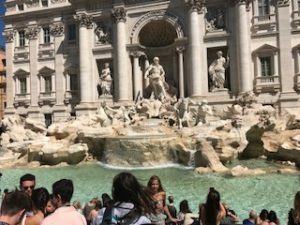 Rome is so packed, it’s ridiculous, so I was always on the edge about my stuff. The walk to the Vatican Museum was so long, but totally worth it. On our way there, we made a few stops and one of those stops had to be the Museo Frati Cappuccini Cripta Ossario. This Museum was so cool because it had a hall of bones. 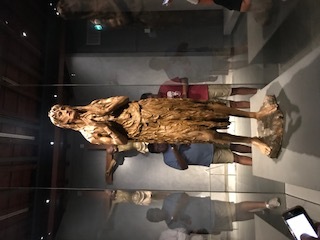 We also saw the San Rocco Di Montpellier sculpture, momentos, and Cappuchos (a tunic with a hood). The Hall of Bones was so neat because the bones were in different sections and were neatly organized to look momentous to the viewers. It was a very symbolic area that represented the many lives lost because the mortality rate was so high, death was and still is inevitable. As Kirk said it best, “No matter how much we try to control our own world, death will always have the last laugh.” The Hall of Bones had a very powerful message behind it, and that’s why I liked it so much. After that, we continued our adventure to the Vatican Museum. It was incredible to see how popular this site was due to the extremely long lines, but also crazy because of the wait. These vendors that kept walking by to sell stuff were so persistent, it was insane. 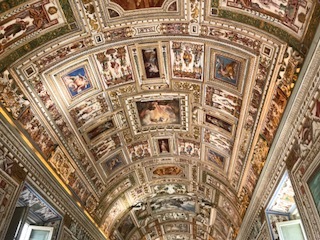 The Vatican Museum was absolutely amazing. It was huge, beautiful, symbolic, and so much more. 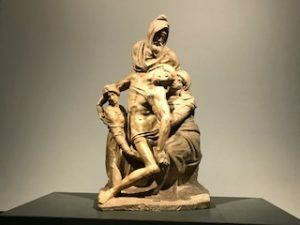 We saw a lot of things from the Laocoon sculpture to the Seven Sorrows of the Virgin Losing Her Son sculpture. Before the Vatican, we saw many fountains that you could drink from! I was so shocked because I felt like that would’ve been very gross to drink from, but Kirk said they’re actually the cleanest water in the city, so I gave it a try. It was actually really good and cold too. I just hope that doesn’t cause any complications later down the road, haha. To end the night, we had a family PCS dinner at this amazing restaurant, with the best service ever, then all of PCS went out for a fun night at a lounge. It was Karaoke night, and you know we blew that stage up. I’m truly going to miss these nights. 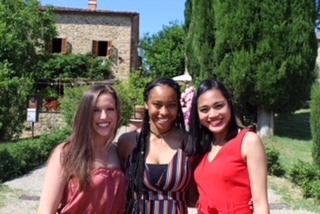 After a long and relaxing day yesterday, we woke up early today to leave behind Arezzo forever and head to Rome for our final days in Italy. The best thing, however, is that I and a couple of other people were selected to do the extended stay, helping at a kids camp in Arezzo, so I’ll be seeing Arezzo soon again. I am excited that I get the opportunity to stay a little longer and serve the kids. 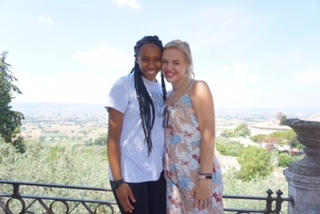 Our trip to Siena was about an hour and a half long and as soon as we got there, I fell in love. The city was so clean, the air was fresh, it wasn’t as crowded, and it was overall just a beautiful city. The only bad thing was that it was so sunny and beautiful at first, and then it started to rain so bad, so we couldn’t really enjoy the city as much. We also tried some really good pizza and sandwich places that was definitely worth the money. The first place we explored was the Basilica Cateriniana Di San Domenico, and it was so amazing. Kirk talked about how Mary became this idol to many people through her path of Christ. Virgin Mary defied all the things that women were suppose to do and followed the path that Christ was leading her. 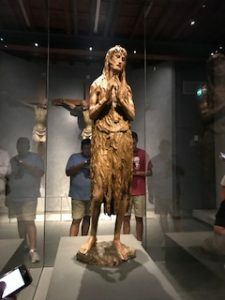 She denied marrying a man and instead said she was married to Christ, she made herself look less than herself, starved herself, became a nun, and performed miracles through the works of Christ. She was an ambassador to speak for us through God. I learned that Roman Catholics pray to Christ and Virgin Mary, but venerate relics, which are evidences of a divine hero on earth. Way back when, Siena was losing a battle and the only hope the soldiers had was to pray to Virgin Mary, which brought them to victory. After that, Virgin Mary became the Queen of Heaven and of Siena and was worshiped greatly. After learning so much about the Duomo in Siena, we had a little free time where I bought a gift for my aunt. We finally left to get out of the rain and headed to Rome. After like four hours, we made it to our hotels, and they were so beautiful and spacious. Rome is such a big and crowded city, so I’m a little nervous, but I think it will be a fun experience. We went to dinner together, and it was so good to have everyone together laughing and having a good time. We were informed that we’re doing a lot of walking tomorrow, so we have to be prepared. I’m very anxious to see what’s to come and to make the best out of these last days with everyone here. 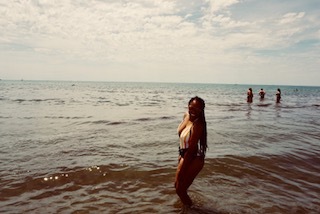 Today was such an exciting day because I was finally getting able to go to the beach. I’ve only been to the beach once in my life, and it was when I was younger, so I wasn’t able to fully understand an experience like that. This was a once and a lifetime experience that I didn’t want to miss out on. We woke up early to catch the trains and surprisingly from there and back the train process was smooth and easy. No one was left, and we made it safe and on time. When we got to Viareggio, the town was very pretty and tranquil. I loved all the palm trees and beach vibes because it was so soothing. The beach was so pretty, and so was the areas that we sat in. It was so funny because the first thing we did was go take pictures. It was like we were having our own personal photo shoot. The people kept starring at us, smiling, because we were taking so many pictures. Eventually, we wanted to enjoy the moment, so we tried hard to stay off of our phones and interact with one another. The water was so cold and a pretty blue color. The view of the mountains from the ocean was so beautiful that we kept wanting to take pictures with the view in the back. I couldn’t help but stare out into the ocean thinking about what amazing opportunity I just embarked on. After awhile, a few of us went to eat and man that place was incredible. One thing Italy never fails at is having delicious and juicy watermelon, and I ate a lot of it. The best part about this trip was just being in the moment and enjoying good vibes. It was very peaceful to just sit and relax without any worries in the world. It felt good to lay down and forget about responsibilities for once, to be stress free, and to treat yourself. I feel like everyone truly deserved a day like this from everyone’s hard work and dedication to PCS. It was a beautiful moment to be around everyone, joking around and getting closer. With the chill music in the background, the sun beating down on my skin, and the breeze blowing, I thought about nothing but myself and the moment. It felt good to think about your own peace of mind. Overall, today was a much needed and relaxing day. Today was a much better day in Florence, and I think it was because today wasn’t as busy as yesterday, and it wasn’t rainy nor gloomy outside. Today gave me a different impression about Florence because I feel like I also got to see a little more besides just the leather shop. Florence is actually a beautiful place when you can see past the overpopulation, the arts definitely bring the beauty out of Florence. Today we went to The Academia where the famous David sculpture stands by Michelangelo. There are five unfinished sculptures in The Academia, and then the one famous sculpture. I didn’t realize how huge it was in person, as books and movies diminishes its great size. 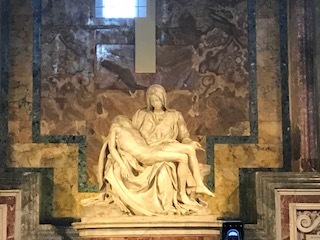 It was so much detail put into that sculpture, and you can tell that Michelangelo took his time on this piece. I learned that the sling shot that’s in the hands of David was equivalent to a 45 caliber bullet; that’s insane. The accuracy of the sling shots were perfect, so the sculpture depicts Davids bold and courageous demeanor as he faced the giant with his power weapon. I learned a lot about Michelangelo and how he wasn’t actually who he depicted himself in his biography. He was definitely not poor as he characterized himself. He was really filthy rich, and was a clever, but harsh businessman as he did for himself and disregarded others feelings. He was smart with his money, and didn’t do art without getting paid because back then creating art just for fun was not a thing. He was the first modern artist which was the transition from a craftsmanship artist to a divinely inspired genius, individuality, and documenting his life (biography). 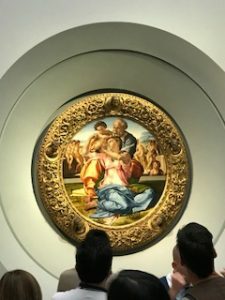 There was an art transition from a Gothic period, to a transition period that began to demonstrate things, to the Renaissance period where emotion and expression was prevalent in art. 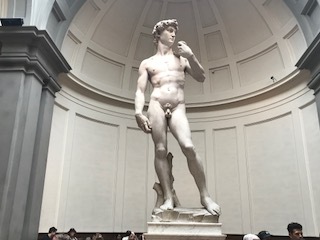 Michelangelo was influenced by Donatello, as Donatello began to learn more of naturalistic arts with realistic looks and the Contrapposto stance, which is the natural stance that humans have as they lean their hips to one side of the body to be more comfortable. 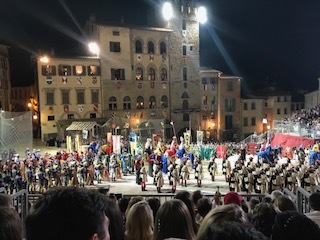 After a day in Florence, we came back to Arezzo and got ready for the Joust. We ate dinner first, then all headed over as a group. Wow, when I tell you that the streets were packed and live, they were packed and live! The whole city of Arezzo came out to watch this, and it was definitely worth it. Everyone roared with enthusiasm, yet people would get really serious because it was very important to win. This setting reminded me of our OU-Texas games that get so hype. There were several small fights that broke out because their team was losing, and several horse that got a little rowdy. It was so much going on, my eyes couldn’t keep up. Even though I barely understood what they were saying, I felt such a rush because of all of the high energy. My team didn’t win; however, they gave it their all. This was the best night I’ve ever had in Arezzo, and I’ll always remember it. Now tomorrow to the beach! Today was the day that we visited Florence, and it was very different. We woke up very early and took a train over there. It was so fun because it was my first experience on a train, so I kept looking out of the window looking out at how fast the train was going. 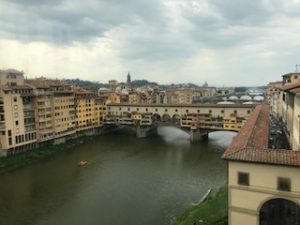 When we got to Florence, it was totally different than what I expected it to be. I thought it would be more eye catching or vibrant as it was described by others, but it was more of a crowded and unsanitary metropolis. I’m not really a big fan of huge cities; therefore, I just wasn’t feeling the environment. It was too high pace and people weren’t as friendly as Arezzo or Assisi. Everything was overpriced too, and I didn’t feel as safe as Arezzo! 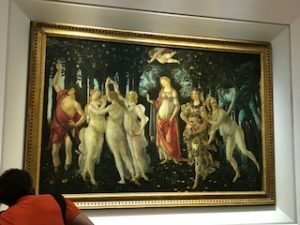 I can say I liked Assisi better; however, the Uffizi Museum was very beautiful, and that was the only reason why I liked Florence, as well as the leather market. The leather market was such an experience, both good and bad. The leather market was so cool because there were so many vendors really trying to sell you good bargains. Today was the day I learned how to stop being so nice and put my foot down when bargaining. I got some great deals because I was stern with my decisions and didn’t let the vendors persuade me. I got my mom’s purse down from $65 to $20, just because I kept telling him that I only had $20 euro until he finally gave in. I was proud of my mischievous lifestyle of striving for better deals because it felt great. I also got my boyfriend a really nice leather gift for cheap too. I did encounter some persistent vendors that would not let me leave until I bought this purse that they kept decreasing the price for. It was crazy, but I eventually got away because I didn’t want it, and they were really upset. I felt bad, but this is a business honey, so it’s eat or be eaten in the industry, and I definitely was going to eat these good deals. What was interesting was to learn about the purpose of romanistic churches for common people, the mortality rates back then, and the roles of women. The church was seen as salvation to people, and women were seen as inferior beings who took care of the house and bared a lot of children. After all this free time, my group finally went into the Uffizi Museum and it was breathtaking! I learned so much information about the arts that I didn’t even think about. Kirk was very into his teachings, as he truly knew his information and was so excited to share it with us. Giorgia Vasari was the mastermind behind the Uffizi Museum, which was written in stories. 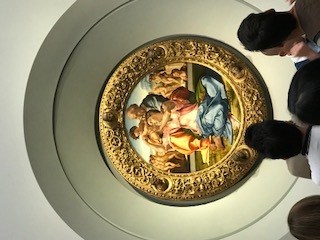 Kirk explained how Vasari’s paintings emphasized perspective, naturalism, and individualism. 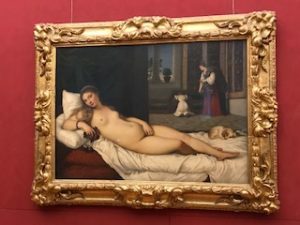 There were paintings by Michelangelo, Botticelli, Flippi, and more but my favorite was the Venus of Rabino down below. It’s the picture of Venus’ body eloquently laying on her bed. This picture was very established as it embodied femininity and beauty. The picture was very engaging as her eyes drew you into her beauty and the portrayal of men sexualizing women. Overall, today was a fun day because of the wonderful lecture and information. I wouldn’t travel to Florence if I wasn’t getting a tour from Krik haha. Today was such an exciting day. We woke up early to catch the bus to Assisi, Italy. It was an hour and a half drive, so it was such a good moment to go to sleep before walking those hills in Assisi. When we arrived, the view was so gorgeous. Seeing the unique buildings and churches was so amazing because these were historic buildings with purpose. We walked up this steep hill to get our ear pieces to hear Kirk lecture about the church. We went to the Basilica of Saint Francis, and learned so much about Francis’ life. We also saw many Frescos that were very beautiful. Being in the moment at the church made me reflect a lot on faith and on the ideas of chasity, humility, and obedience. The way Kirk described the importance of the Christ and salvation really made me ponder on my life walking through Christ. What was interesting was learning about Francis’ transition to serving Christ and how he received his Stigmata, the wounds of Christ. It was astonishing because Francis lived a wealthy life and could have had anything in the world, but he was called to save and reform the churches, so he did just that. He did live a crazy lifestyle before he began to follow Christ, but that’s understandable since he was the son of a rich merchant. Unfortunately, Francis’ father did not understand or like the idea of Francis giving up his glorious life to give his last in serving others, so he brought his son to court. Happily, the bishop sided with Francis and liked his idea, so Francis went on his journey performing miracles and striving to convert others, yet the struggle with the Pope and power was intense. After learning so much information, we had some free time. We went to look at the Basilica Di Santa Chiara, and we saw the area where she was buried at. It was so beautiful and had so much history behind it. Later on, we ate some really good pizza, and I bought a gift for my oldest sister that I think she’d really like. The stores were so nice and had really good stuff for gifts. We finally took the trip home to get back to Arezzo, and we went to eat dinner at Tokyo. I got chicken and rice, and it was so good. We also had our extended stay meeting discussing our plans for the camp, and boy am I ready for that! Right now I’m at the monastery washing clothes and writing my blog, getting ready for Florence tomorrow morning. Today was press conference day, and it was so awesome! There was a real reporter asking questions to Lucho, two of our PR PCS friends, and others. It was a real interview that will be publicized on TV in Arezzo. Everyone else was in the back smiling and waving. Now I can go back home and tell everyone that I’m just ya know, a local celebrity in Arezzo, Italy. It was so sweet getting to hug the girls and interact with them one last time. What was even sweeter was that the girls had little crushes on some of our PCS boys, so they took pictures with them. Oh, young love! After we said our farewell, we went to eat at Piadena, a really good sandwich place. The food never fails me here, then I went shopping for the first time. I’ve been so concerned about getting family gifts here that I needed a moment to think about me haha, but that wasn’t a good idea with how pricey it was. Later on my group bought our train tickets for our free day to Viareggio, and it was so stressful haha. I think we all made it more complicated then it should have been, but we got it done and are all set and ready to go for Sunday. Finally everyone got all dressed up ready to go wine tasting. 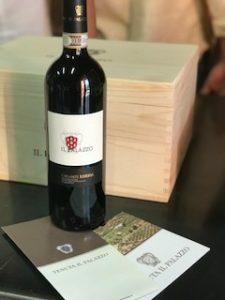 We were in the beautiful hills of Tuscany, tasting wine from IL Palazzo. We tried three wines: White Wine with Bruschetta, Chanti Riserva with salami meat, and Morosso with cheese. My favorite wine was the Chanti, so I had to buy a bottle for my grandma because she loves red wines. We were informed about the history of wine, the process of how it’s made, and important details about wine. 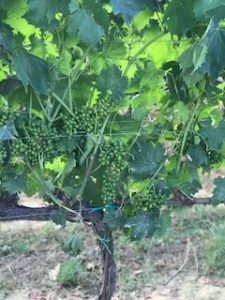 We went to look at the grapevines where the process all begins, to the fermentation building, to the area where all of the wine is stored and ready to be sold, to finally the store where the wine is ready to be bought. It’s crazy because these processes of wine making takes weeks to years. It was astounding at how precise and committed the owners were in making wine. The winery was so much fun because it was something that I’ve never experienced before. I didn’t even think I’d like wine, but you can’t judge a book by it’s cover; am I right? We took so many pictures because of the beautiful scenery and shared many laughs and good moments. That was definitely a once in a life time experience that I’ll never forget. After the the winery, we headed back to the monastery to have a good ole American BBQ. Fabio, the chef, is always cooking up something great in the kitchen. The sausages, ribs, fries, dessert, pretty much everything was so good. It was a great way to end the night. Tomorrow we have our day trip and, we have to wake up real early, so I’ll head to bed. Chao!